At the UW, managers and supervisors are responsible for establishing and maintaining good health and safety practices, including controlling exposures to airborne contaminants, such as dusts, vapors and other aerosols. Whenever engineering or administrative controls are not feasible or practical, or in emergency situations, you may need to use respirators and other personal respiratory protective equipment to protect employees and students from inhalation hazards. The Respiratory Protection Program outlines the requirements and the University’s procedures for using respiratory protection in a safe and effective way that is compliant with applicable regulations. EH&S will conduct a respiratory hazard evaluation, either for the general work environment or for a specific task. Based on the hazard evaluation, EH&S will determine if respirator use is required or voluntary. Sometimes EH&S will decide not to recommend respirators because exposures can be mitigated with other controls or work practices. You may also be part of an existing user group that has established required respiratory protection for certain work tasks. Medical clearance is required before you can wear a respirator. Wearing respirators can put additional stress on the heart and lungs, and may cause some to feel anxiety or claustrophobia. The UW Employee Health Center performs the medical clearance. You fill out a simple, confidential questionnaire that will only be reviewed by Employee Health Center staff. If you are not medically cleared, you are not authorized to work in an environment where respirators are required. Online training is available for some commonly used respirator types. In-person training is also offered for specific user groups as appropriate. You will receive training on the hazards, limitations and capabilities of the respirators assigned, and how to properly inspect, use, clean and store them. 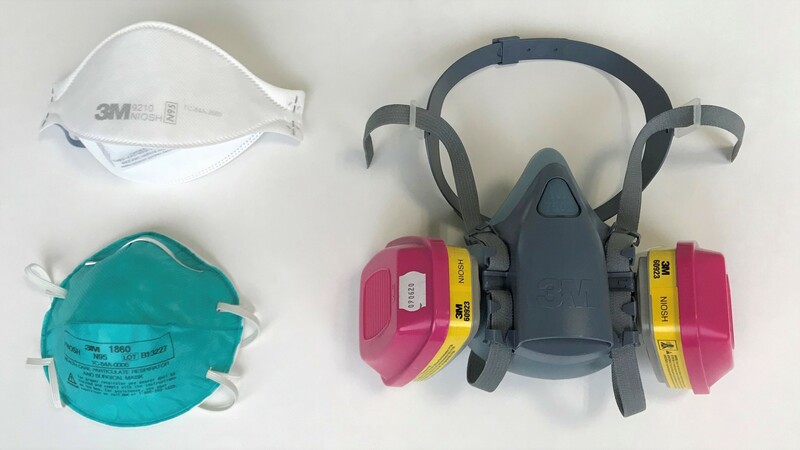 Fit testing is a quantitative or qualitative test performed by EH&S to determine if a specific make, model and size of respirator fits your face. Specifically, this test verifies that a mask doesn’t leak and provides adequate protection. If you are required to wear a tight-fitting respirator (e.g., N95 or half-face elastomeric respirator), you must be fit tested. Facial hair may interfere with a tight-fitting respirator’s seal; you should be clean-shaven in order to effectively wear these respirators. Loose-fitting respirators (e.g. powered air-purifying respirators) require hands-on training instead of a fit test. If you are required to use a respirator, you must be trained and fit tested every 12 months. Recognize airborne chemical and particulate exposure hazards, and contact the Respirator Program Administrator (206.616.3777 or uwresp@uw.edu) if you believe that respiratory protection may be needed. Ensure employees complete their training and fit testing annually. I want a respirator. How do I get one? First, talk to your supervisor. If he or she already has authorization for respirators to be used for the work you are doing, you can be added to the user list and start the enrollment process. If your supervisor doesn’t have an existing group for the work you’re doing or if your exposures might be different, contact the Respirator Program Administrator and fill out a Respirator Request Form. EH&S will help you determine if respirators are the right choice, and if so what kind. I already have a respirator, but I’ve never been involved in the respirator program process. What should I do? This depends on the kind of respirator you are using. Filtering facepiece respirators (disposable N95s) can sometimes be used without enrollment in the program. This is known as “voluntary use” (see question 3). However, the law requires enrollment if you are using cartridge-style respirators and all other kinds. Notify your supervisor and contact EH&S for next steps. What do you mean by “required respirator use”? How is this different from voluntary use? EH&S has determined that your exposure to a specific airborne contaminant is likely to exceed an established Occupational Exposure Limit (OEL), which are established by law to protect worker health. Your supervisor or department has chosen to require respiratory protection as part of a specific job task. For Voluntary Use, no respiratory hazards have been identified that would overexpose an individual, and respirator use isn’t required as a department policy. Individuals may choose to wear a respirator as a precautionary measure or for a specific chemical-sensitivity. If these are filtering facepieces (dust masks), no enrollment in the respiratory program is required. Voluntary users must inform their supervisor they want to wear a respirator on a voluntary basis, must review the Advisory information for Employees Who Voluntarily Use Respirators, use the respirator safely and according to manufacturer’s instructions, and report any problems with use. Why can’t I have a beard and wear a tight fitting respirator? Facial hair cannot interfere with the seal of a tight-fitting respirator around the mouth and nose. Even stubble can create leaks and expose you to airborne contaminants. Mustaches can sometimes be allowable depending on their width and if they don’t lie within the seal area. It’s the law. Who is responsible for paying for my respirator and the other supplies it comes with? If you are required to wear a respirator as part of your employment with the UW, the University is responsible for providing you with respiratory protection equipment, training, and a medical evaluation. How long does it take to get authorized to use a respirator? This depends on if you are being enrolled in an existing group, or if a new hazard assessment is required. The latter depends on the complexity of the workplace being assessed. Generally, once a medical clearance form has been submitted to Employee Health, clearance, training and fit testing can be conducted within two weeks. When renewing annual respirator authorizations, supervisors should look to start this process at least a month prior to expiration. It is taking a while for Employee Health to process my medical clearance. Why might this be? Each form must be personally reviewed by a licensed healthcare practitioner, which takes time. In addition, if the nurse reviewing your form has follow-up questions based on your questionnaire, he or she may reach out via phone or even look to schedule an in-person appointment. Contact Employee Health (206.685.1026 or emphlth@uw.edu) with questions on this. Are there other ways to control my exposure to airborne contaminants? Absolutely! Personal Protective Equipment (PPE) is a last resort. It is much more effective to enclose a process, provide additional ventilation, use a different chemical or material or change work practices to control exposures. EH&S can help consider these options when performing a respirator hazard assessment. All EH&S-provided respirator training is individually assigned by user group; these online courses are not available via the EH&S Training website. UW Facilities employees seeking to attend an in-person class should refer to the training course schedule posted online. Please note that these classes are applicable to UW Facilities employees only. Changes in a work practice or procedure to minimize exposure to a hazard. Example: written safety procedures or task rotation. a fume, vapor, mist, aerosol, gas, or dust created by a work process that can expose workers through the inhalation route. Examples: silica, asbestos, corrosive gases, volatile chemicals used in research animal allergens. a respirator piece consisting of a filter or chemically-absorbing substance in a plastic case, which can be fitted onto a cartridge-style respirator to remove contaminants. These pieces typically come in pairs, and need to be changed on a regular basis in order to be effective. a dust mask-style respirator that covers the nose and mouth, is made of disposable materials, and is one-time-use only. These are commonly used in healthcare settings. a respirator that provides fresh air under positive pressure to a hood or head cover, and does not rely on a seal to operate. Example: powered air-purifying respirator (PAPR). a respirator that relies on a seal around the mouth and nose or entire face in order to function properly. Example: filtering facepiece or cartridge-style respirators.healthcare settings. Example: N95 or P95 respirators.